There are plenty of ‘big data’ analytics companies out there, particularly in the eCommerce space, but I was intrigued to find out more about a company called Order Dynamics. Order Dynamics’ strap line is pretty self-explanatory: “powering the new reality of retail: helping retailers activate commerce from first interaction to fulfilment”. The company offers a number of data solutions which aim to help retailers with their omni-channel approaches. This means that Order Dynamics covers the full customer journey, irrespective of the customer channel of choice (e.g. online and offline). Multiple dimensions – There are at least 3 different dimensions to omni-channel retailing: (1) “Brick2Click” – integration by physical store and online store, for example customer support (2) “Device2Web” is all about the customer reaching the online store through multiple devices (e.g. mobile, tablet, PC) and (3) “eAve2Web” – Think of online market places or “eAves” whereby customers are directly served through a central database which contains e.g. customer ID and order ID. Customers are likely to use a variety of these channels before a reaching a purchase decision (see Fig. 1 below). Key drivers – As becomes apparent from looking at diagram in Fig. 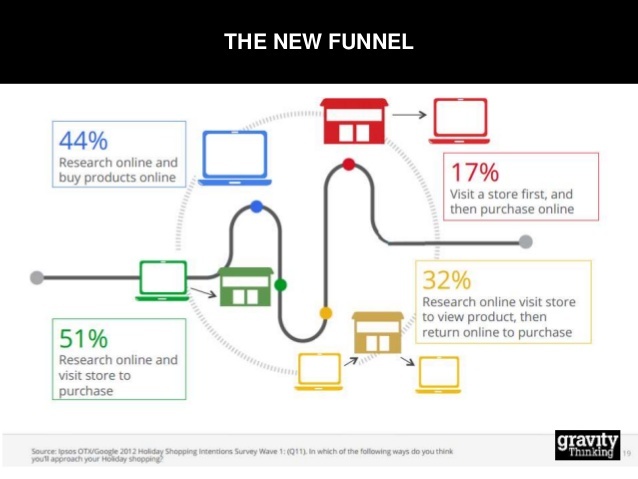 1 below, omni-channel retail is very much driven by the consumer and the channels she decides to engage with. Cost savings are another important driver, with retailers trying to optimise for efficiency in the way they manage the different channels. I guess the trick to aim for a healthy degree of synchronisation between the different channels, to avoid ending up with separate warehouses or systems for each individual channel. I can imagine that this is at the heart of what Order Dynamics do; helping retailers to manage their multiple channels as effectively and efficiently as possible, using real-time data to be on top of the performance of each channel. Challenges to consider – I came across a brief document from 2008 titled What is multi-channel retail: benefits, challenges and impacts by Rizwan Taybali which helped me in getting a better idea of some of the challenges involved in omni-channel retailing (see Fig. 2 below). I can imagine that treating the customer journey as a one single experience, even though it can involve multiple channels, is probably a key challenge for most retailers. In-store pickup – Order Dynamics provides tools to help retailers manage complex in-store fulfilment scenarios, for example to ensure retailers keep the right amount of in-store inventory to fulfil online orders. This facilitates “rapid fulfilment”, whereby online customers can pick up their orders immediately at their most convenient location. Ship-from-Store – This is all about helping clients to make their operations more efficient and provide faster delivery. Order Dynamics’ solutions can help in converting brick and mortar retail stores into localised distribution centres for online order fulfilment. Once customers purchase online, their order passes through the intelligent order routing system that a retailer has created based on individual store-level requirements and inventory reserves, routing automatically to the optimal store for fulfilment. Single customer profile – I can imagine that having a single customer profile is a critical requirement for any omni-channel retailer. Order Dynamics’ data solution enable retailers to have a unified, real-time view of their customers across their different channels. Retailers can aggregate customer order information, preferences and shipping behaviour into a single repository to drive customer satisfaction, loyalty and business decision making (see Fig. 3 below). Save-the-sale – “Save the sale” refers to helping customer service agents mitigate the impact of order cancellations or out of stock issues. Buy anywhere, return anywhere – Order Dynamics’ data solutions help retailers to manage things like cross-channel returns and inventory allocations by supporting reverse logistics (i.e. all operation related to the reuse of materials and products) and handling of returned inventory. Products returned in-store can either be shipped back to the fulfilment warehouse or automatically flagged to be utilised for the next online order. Multi-channel customer care – Customer experience is key here. It’s about providing a high level of customer service which is consistent across all retail channels. For example, retailers can improve the customer experience when contacting a call centre by providing customer service agents with fast access to a single, accurate view of the customer, including orders, history and preferences. Main learning point: I’m hoping to learn more about both omni-channel retailing and Order Dynamics’ data driven solutions in this respect. It would also be interesting to find out more about which retailers have truly cracked omni-channel retailing. This definitely is a vert interesting and rich area for me to explore further! Evaluating cost of investment in development of effective, secure and scalable environments and systems integration against probable short term impact on bottom line. Pricing across different channels – Store channels have higher cost structures than web channels for example, and price competition is higher on the web but consumers can be put off by different pricing for the same product. Channel synchronisation i.e. ensuring brand, customer experience and customer information consistency across channels while avoiding the ‘3E’ trap i.e. trying to provide ‘everything to everyone everywhere’. Problems in merging and standardising customer data i.e. unifying different systems which may have very different data models. Difficulties in reducing or abolishing organisational boundaries to cope with new channels.